Ability to send reminders to your mobile phone or email address on the day and time specified. Direct ties with your Bills so if you modify the name on your Calendar for a Bill, it will also be reflected on the My Bills page. With the group feature, you can categorize your reminders and then quickly show and hide the ones you want. Each reminder has the ability to be color coded so you can quickly see your reminder due dates based on the color. Note that Bills and Income will already have a color set for them. 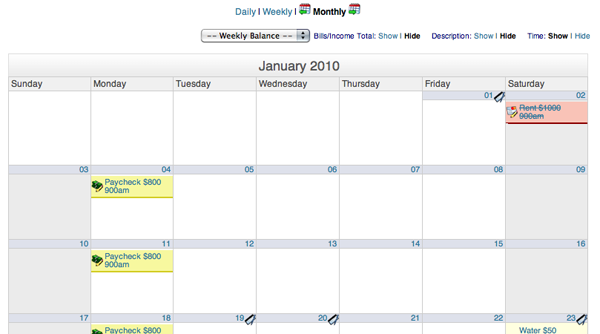 At the top of the page you can select an account filter to view your daily or weekly balances built into the calendar. Support for Monthly, Weekly, or Daily reminders. If you sign up on the Business plan, you also have the ability to expose your calendar to your employees.